Cole stiffened. He glared at Wyatt. “I haven’t told her a thing,” Wyatt said with raised palms. His mouth opened over her observations. He looked again at Wyatt. His brother gave him a look that said, See? “But how do you know it’s a rotator cuff injury?” Cole asked. Could other people see what she did? If so, he was so screwed. Despite what he’d seen this evening and his brother’s assurances, Cole was surprised by Everly’s quick assessment. She looked like she should be out club-hopping, not spouting medical jargon with such an intent expression on her face. He also realized, since she knew his profession, that she had known who he was the moment she saw him. So why hadn’t she mentioned that before now? Maybe she wasn’t a fan. He moved over to the desk. Everly stepped to the side as Wyatt reached over to retrieve the large manila envelope resting there. She hit Cole’s leg and nearly toppled onto his lap. Out of instinct, he reached out to help her maintain her balance. His hands ended up on her nicely shaped rear end. She sprung away like a gazelle fleeing a lion. When she turned to look at him, he realized her cheeks were nearly as red as her hair. Her reaction went a long way toward putting him back on an even keel. He patted the cushion beside him. She looked at it warily, then moved her gaze to him. He patted the cushion again. Her lips moved on a whispered comment of some kind as she stepped around his legs and sat down. It was a small victory, but he felt better. When he turned to look at her, he caught her scent, a unique fragrance that reminded him of whipped vanilla cream and frosted wildberries. She met his gaze. The combination of her nearness, her scent, and the cautious look in her lovely eyes had his whole body reacting. Oh, this was such a bad idea. The author is hosting a Release Giveaway of (2) signed paperbacks of For Everly, a custom For Everly inspired bracelet worth $35, and a $10 Amazon Gift Card. This is open to the U.S. and Canada. The giveaway ends June 14th. Raine Thomas is the award-winning author of a series of YA Fantasy/Romance novels about the Estilorian plane, including the Daughters of Saraqael Trilogy and the Firstborn Trilogy, and a New Adult Contemporary Romance, For Everly. 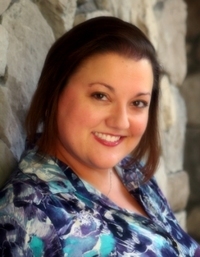 She is a proud member of Romance Writers of America and is a contributing blogger to The Writer's Voice. When she isn’t planning weddings, writing, or glued to social networking sites, she can usually be found on one of Florida’s beautiful beaches with her husband and daughter or crossing the border to visit with her Canadian friends and relatives.